fun in a winter wonderland! Please excuse my cheesy rendition … but I have had Christmas carols playing on the radio while I played with Cindy’s new Happy Christmas kit! This kit is so fun… playful and bright. The elements are a great combination of whimsical and elegant. 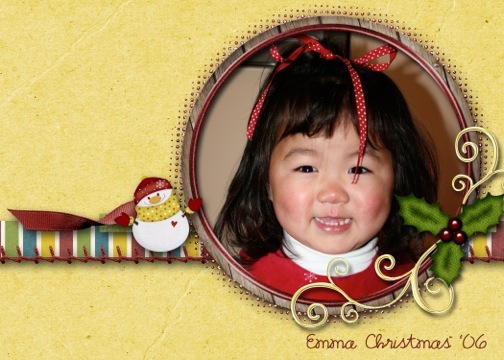 And, as always, Cindy’s frames make highlighting a favorite photo or series of photos easy! You can get the kit at Digitals. And Cindy made a cute cluster frame for me to give you, click on the image to download. Happy Christmas and thanks for reading! How do I download this freebie? 4Shared won’t let me unless I become a member.